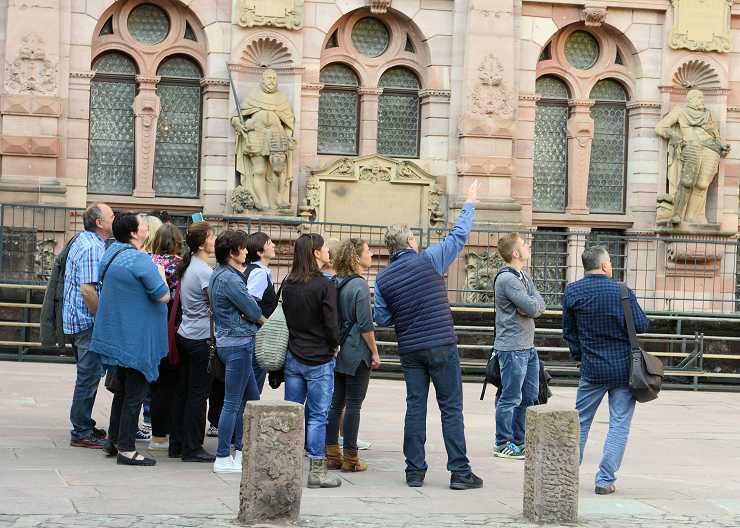 Take one of our Heidelberg sightseeing tours to discover and experience why this city has delighted travellers from across the globe for centuries. With our classical City Tour, you can see the most beautiful sights of Heidelberg, such as the Gothic Heiliggeistkirche (Church of the Holy Spirit), the Jesuitenkirche (Jesuit Church), Universitätsplatz (University Square), and the numerous picturesque alleys of the Old Town. Standing on the world-famous Alte Brücke (Old Bridge), you will enjoy the impressive city panorama with the castle ruins, which already fascinated painters and poets of the Romantic period, towering above it. A visit to the famous ruins above the Neckar valley is a must for every traveller to Heidelberg. 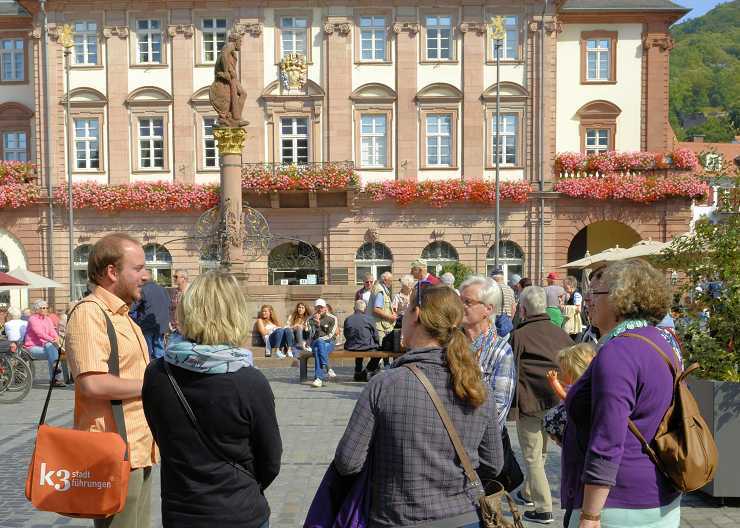 Hence we offer both a short visit during the sightseeing tour of Heidelberg or, if you have more time, a lengthy castle tour through the ruins’ elaborate, fascinating gardens, inner courtyards and terraces. Another especially enjoyable tour is our evening sightseeing tour through Heidelberg. Stroll through the Old Town’s lanes and alleys to its most romantic spots as it settles down for the night. While on the Alte Brücke (Old Bridge) during your “The Romanticists” walking tour, try to rediscover the spots from which painters such as William Turner once captured the view of the city and ruins, and then walk around the university in the footsteps of prominent poets such as Friedrich Hölderlin, Joseph von Eichendorff, Achim von Arnim and Clemens von Bretano. They all spent productive years in Heidelberg and are regarded as founders of Heidelberg romanticism. To find out more about university life in Germany’s oldest university town, take our sightseeing tour to the magnificent library, the Alte Aula (Old Auditorium) and the Neue Universität (New University) erected in the Bauhaus style. You will hear about the history of the university (formerly the “Ruperto Carola”) since it was founded in the year 1386, and about some of its famous alumni such as Friedrich Hegel, Hannah Arendt, Robert Schumann and Helmut Kohl. 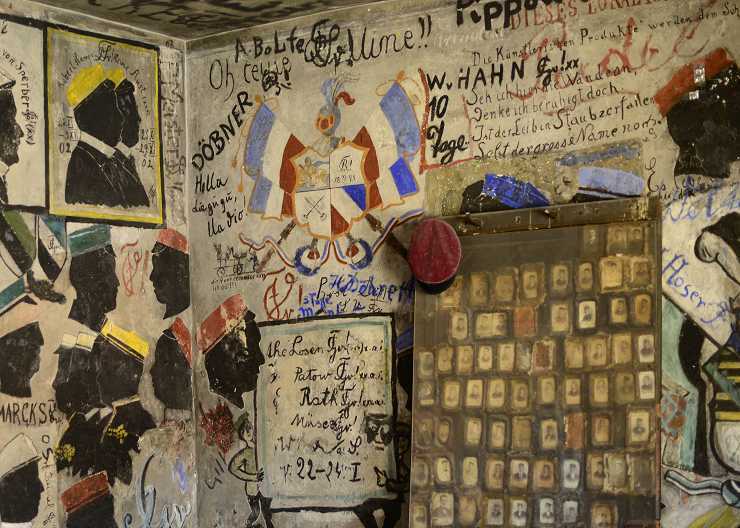 The University Tour includes not only venerable buildings and academic dignitaries, but also a stop at the Student Jail, whose painted walls provide a remarkable report on student life in the 19th century. 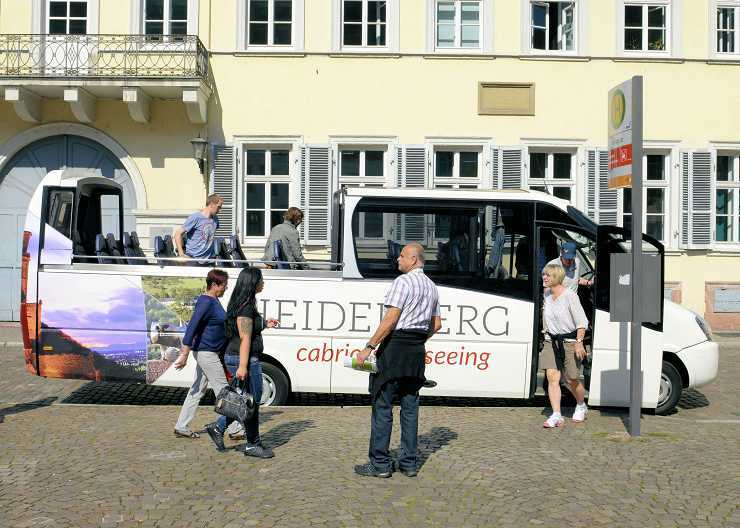 When you take a Heidelberg sightseeing bus tour, our guides will be glad to show you districts that are too far away from the Old Town to be reached on foot. During the tour through the beautiful landscape of the Neckar valley, past the university’s research facilities, you will hear how Heidelberg succeeds at combining its historic flair with ultra-modern research of world class level. We recommend the Philosophenweg (Philosophers’ Path) Tour to all those who are able to walk quite a distance and would like to explore Heidelberg on a hike far away from the usual sightseeing tour routes. In addition to receiving information about the rare plants that are able to grow here due to optimal climatic conditions, you will also be greeted by enchanting views of the Old Town on the opposite side of the Neckar River.